Recently, I've come to the conclusion that there is no better match for pears than chocolate and hazelnut. Shredded pears baked into a spice cake it moist and heavenly - the pears almost melted into the cake itself. 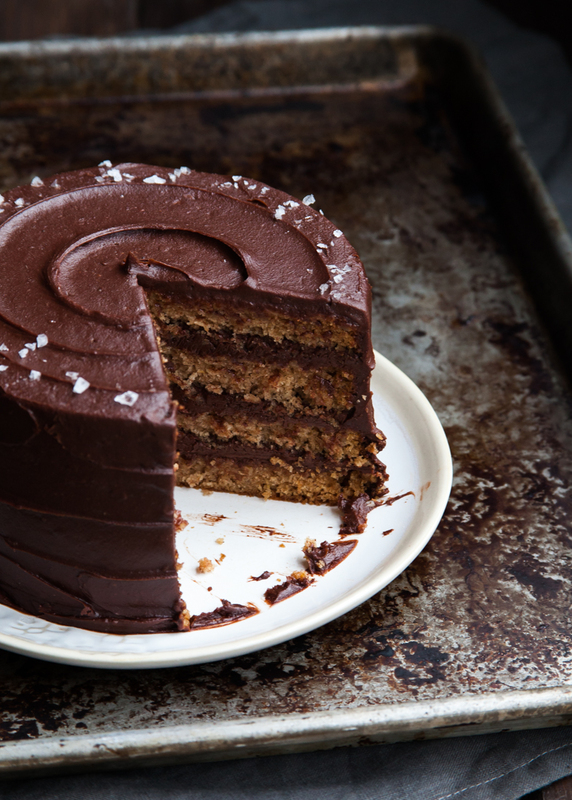 Smoother said pear cake in the silkiest, creamiest chocolate-hazelnut frosting and it is nearly life changing. Or life-saving, in my case. Between various colds and teething, we've had a rough week over here. There's been very little sleep and lots of crankiness all while watching my baby suffer through his first real cold - absolutely heart-breaking. I've had about a slice of this pear chocolate hazelnut gianduja cake every night for the past week, and there truly is something comforting about those flavours and textures together. Plus, chocolate - there's never a situation to tough that chocolate can't handle. Who's heard of Gianduja before? It is a type chocolate that contains hazelnut paste - think Nutella, but waaaay better. I first had gianduja as part of my wedding cake. One of the best chocolatiers in California made the most magnificent dessert spread for mine and Brett's wedding in 2010. Ginger Elizabeth is a chocolate and pastry wizard. She used the same flavours from this dessert that she sells at her shop and turned them into one of the layers in our wedding cake. I've had that cake on my mind for 5 years now, and just recently picked up some gianduja chocolate of my own to work with. The gianduja chocolate I used was actually something I just happen to stumble on at Whole Foods. You never know what gems are hiding in that store! The chocolate is a bit softer and sweeter than the bittersweet that I usually bake with, but I knew I would make it work somehow. I wanted to make a frosting that was beyond your typical fluffy fudge - made primarily of butter, cocoa powder, and tons of powdered sugar. 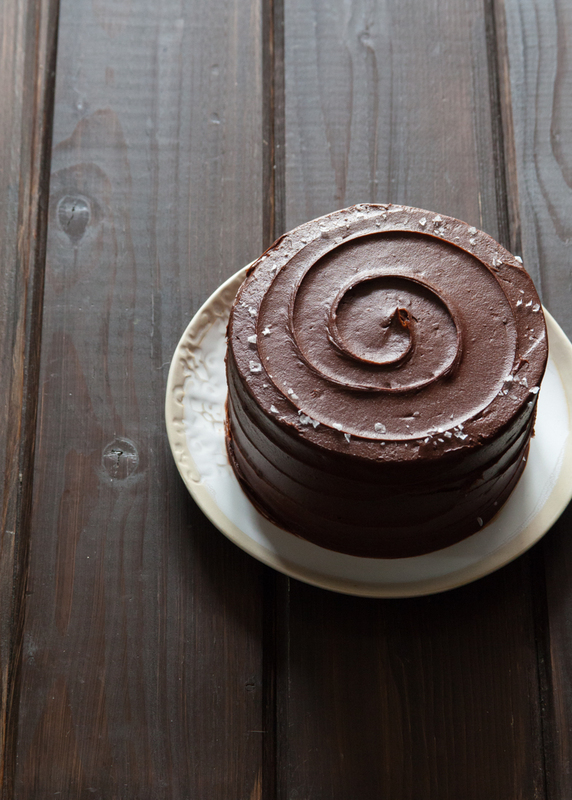 I found this amazingly silky chocolate frosting recipe on Sweetapolita and adapted it to include my new purchase. The chocolate and hazelnut pair so wonderfully together and create the most delectable frosting for my pear spice cake. I left out most of the salt, and sprinkled on some Maldon Sea Salt on the finished, iced cake instead. To top it all off (because you know I have a hard time stopping when it comes to layer cakes), I made this subtly spicy and earthy caramel sauce. It is infused with cinnamon, cloves, and rosemary - with some ground spices and cayenne stirred into the finished sauce. The spices complimented those in the pear cake while the bit of cayenne created a bit of an unexpected kick. Feel free to add in as much or as little of the heat as you'd like. You can find the spicy caramel recipe over on Domino. Pre-heat oven to 350 degrees. Grease and flour two 6-inch cake pans and set aside. In a large mixing bowl, sift together the dry ingredients. Stir in the sugar and set aside. In a separate mixing bowl or large measuring cup, whisk together the egg, egg yolk, oil, sour cream, and vanilla. Whisk the wet ingredients into the dry ingredients until combined. Fold in the grated pears. Evenly distribute the cake batter between the pans and bake for about 32 to 35 minutes, or until a toothpick inserted into the center of the cakes comes out clean. Cool on a wire rack for 15 minutes before removing the cakes from their pans. Let completely cool (or chill wrapped in plastic), then trim the tops and cut each cake in half horizontally to create four, even layers. Cream the butter until soft and smooth. Gradually add in the sugar and cocoa powder until everything starts to incorporate. Add in the sour cream and vanilla and mix until combined. Add in the melted chocolate and mix until smooth and creamy. Chill the frosting until desired consistency or it is spreadable (about 15 minutes), if needed. As we head deeper and deeper into Fall, I tend to favor more dramatic and shadowy images. I like to have the option to go all dark and moody when the weather gets cloudy. In fact, I even wrote about it! For more information on shooting these types of photos and to take a peek at some of the behind-the-scenes for this particular cake set-up, head on over to Food Bloggers of Canada!